A parliamentary report of 1777 recorded parish workhouses in operation in Rugby (for up to 25 inmates), Grandborough (20), Long Lawford (8), and Crick (9). On 27th June 1818, Rugby, together with the parishes of Bilton, Hillmorton, Church Lawford, Long Lawford, Clifton upon Dunsmore, Kings Newnham, Leamington Hastings, Newbold on Avon, and Newton, formed a Union under Gilbert's Act of 1782. Amongst other things, the Union had the power to operate a "House of Industry" and on 1st August 1818 a contract for construction of the building was signed with a local mason, Thomas Harrall, and carpenter, Richard Over. The workhouse, at the south side of Lower Hillmorton Road in Rugby, opened on 24th June, 1819. The sleeping quarters were fitted out with 50 iron bedsteads each with deal bottoms, straw bolsters, a blanket and two sheets. As the workhouse was intended to accommodate up to 120 inmates, a certain amount of bed-sharing was to be expected, particularly amongst children. Male inmates were given the task of making hemp sacks, while females did spinning. The Union gradually expanded and by 1821 comprised 21 parishes. County of Warwick: Bilton, Birdingbury, Bourton, Brandon and Bretford, Brownsover, Churchover, Clifton-upon-Dunsmore, Combe Fields, Cosford, Dunchurch (2), Frankton, Grandborough, Harborough Magna, Hillmorton, Kings Newnham, Church Lawford, Little Lawford, Long Lawford, Leamington Hastings, Marton, Newbold-on-Avon, Newton and Biggin, Princethorpe, Rugby (3), Ryton-upon-Dunsmore, Stretton-upon-Dunsmore, Thurlaston, Willoughby, Wolfhampcote, Wolston. County of Northampton: Barby with Olney, Clay Coton, Crick (2), Elkington, Kilsby, Lilbourn [Lilbourne], Stanford, Yelvertoft. County of Leicester: Westrill and Starmore (Lutterworth union from 1895). Later Additions: Brinklow (from c.1837), Easenhall (from c.1837). The population falling within the Union at the 1831 census had been 16,668 with parishes ranging in size from Westrill and Stromore (population 7) to Rugby itself (2,501). The average annual poor-rate expenditure for the period 1833-35 had been £11,028 or 13s.3d. per head of the population. The new union took over the existing Rugby workhouse, for which it paid a rent of £160 a year to the ten original Gilbert Union parishes who still owned the site. This continued until 1849 when the union bought the site for £4,000. The workhouse location and layout are shown on the 1903 map below. Rugby casual ward and entrance block from the north-west, c.1914. The building at the west of the entrance had a much more elegant design and contained the Union offices on the ground floor and Guardians' board room on the first floor. The board room also doubled as a chapel for the workhouse. The building was extended several times over the years as the number of Guardians increased. Rugby workhouse board-room from the north-east, 2000. To the rear of the main block was a large courtyard subdivided by walls to create exercise yards for the different classes of inmates (male/female, infirm/able-bodied etc.). Females were placed at the west of the workhouse and men at the east. To the rear of the yard was the original workhouse infirmary. In 1866, following pressure from the Poor Law Board, this was improved and a full-time nurse was appointed. Further extensions were made in 1873 and 1895. In December, 1906, a new 66-bed hospital block was opened at the south of the workhouse. As well as a male and female ward on each floor, it contained operating theatres on the ground floor, and seven nurses' rooms in an attic space. Washing and toilet facilities were placed in sanitary towers on the north side. After the opening of the new building, the old infirmary was then used to house the kitchens and dining hall on the ground floor, with infirm wards above, and a children's ward on the women's side to the west. The workhouse laundry occupied a large block at the west of the main yards. The workhouse layout in 1913 is shown below. On the afternoon of 14th January 1842, a tragedy occurred after Thomas and Sarah Brunt, their four-year-old son Thomas, and two younger children were admitted to the workhouse. At 5pm, the children were taken to the kitchen to be fed bread and cheese and then let out to play. At bedtime, Thomas could not be found. After some searching, the kitchen's cellar door was found to be open. The cellar was never used as it was undrained and always had several feet of water standing in it, although the top of the steps was used for storage. After a lamp was brought, bread was seen floating on the water and Thomas's body was then recovered by one of the paupers but he could not be revived. A bruise was found on his right temple, assumed to be caused by falling down the stairs after he had gone through the wrong door. The workhouse had its own school which between 1872 and 1892 contained around 30 children. The school closed in 1894, with a "Children's Caretaker" replacing the teacher. In around 1912, the Union set up three children's homes — the McClure and Townsend homes were in Charles Street, and the Mitchison home in Cromwell Road. At the meeting of the Rugby Board of Guardians, on Monday, the workhouse master reported that a young woman and her two children left the house on Saturday. It appears that last Christmas a young widower, hailing from a northern town, was admitted to the casual wards. He was a painter, and stayed on at the workhouse for the three weeks and did some painting. He saw the girl, and, taking a fancy to her, asked her to be his wife. She declined at first, but before he left about the middle of January he had so far been successful in his suit that he told the workhouse master he would return and marry her on March 26th. He returned to his home, where he secured regular employment, and kept up a constant correspondence with the girl. Most of those who had a knowledge of the affair were sceptical as to the man's sincerity, but, traveling all night last Friday he presented himself at the Workhouse soon after nine o'clock with an outfit for his intended bride. This she put on, was married by the Registrar at the Union Offices, and before mid-day was travelling northward with her husband and children. From 1930, the workhouse became a Public Assistance Institution providing care for the infirm and elderly and the chronic sick. During the Second World War, the site operated as a hospital under the Emergency Medical Scheme. From 1949, the buildings became St Luke's Hospital as part of the National Health Service. St Luke's closed in 1993 and most of the site is now occupied by a health centre. By the 1920s, The Rugby Union had established children's scattered homes in Rugby at Mitchison Home, Cromwell Road; McClure Home and Townsend Home, Charles Street. Each could accommodate 15 children. 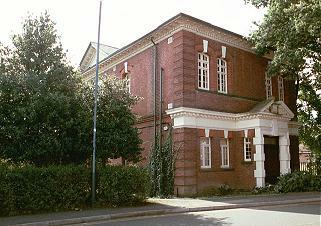 Warwickshire County Record Office, Priory Park, Cape Road, Warwick CV34 4JS. Holdings: Agreement for founding of Gilbert Union (1818); Guardians' minute books (1836-1930); Accounts (1836-1930); Children's Home register of indoor relief (1912-36). 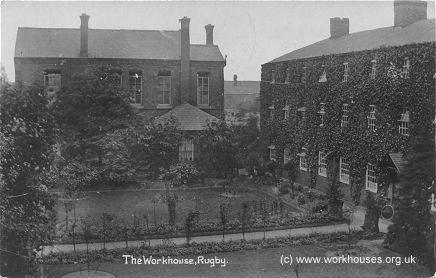 Rugby Local History & Research Group (2001) St Luke's Hospital & Rugby Union Workhouse 1819-1993. Rugby Local History Research Group. Thanks to Karen Ford for passing on the workhouse romance story, and to Malcolm Wright for census transcriptions.